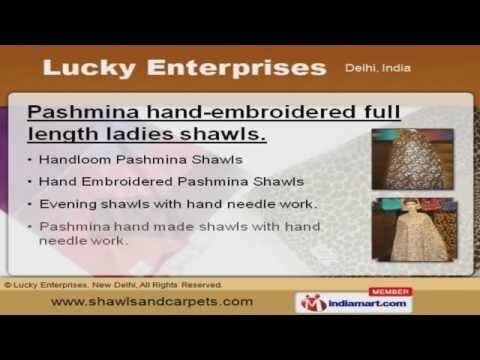 Welcome to Lucky Enterprises, Manufacturer and Exporter of Hand Knitted Carpets and Shawls. The company was incepted in the year 1984. We are Equipped with hi-tech machine sand Capacious warehousing unit. Paid sampling policy, Easy payment modes and Exquisite craftsmanship make us the first choice of our clients. We offer a splendid range of Shawls, Muffler, Carpets and Rugs. We offer 100 pashmina black and white boxes shawls at industry leading prices. Our Pashmina hand-embroidered full length ladies shawls are widely acclaimed in the market. We are instrumental in offering Shawls, Stoles, Scarves and Muffler. You can avail from us an exclusive range of Stoles & Shawls. Our Carpets and Rugs are in huge demand across the global markets.